Hi everyone, sorry I've been away for so long! I've managed to get onto SL for a little while this weekend, and whilst I was on, I found some lovely goodies for you - all with a spooky theme! Now, a very good friend of mine invited me along to a live music event with a Halloween costume contest. And of course when it came down to getting dressed up, I had nothing to wear as per usual. So I went on a quick search for something spooky! As many of you will know, I love zombies! So of course, I decided to go as a zombie. But not just any old zombie....A BALLERINA ZOMBIE WITH BRIDE OF FRANKENSTEIN HAIR! WIN. Some of this was 10$L or below....the shoes were a bargain for the fatpack at just 99$L (with colour change HUD! ), and the dress was 200$L....yes I know, not like me to splash out is it - but I'm allowed a treat once in a while, and it was for a special occasion! So nerrr! And here are the shoes....these are the Locket Ballet Heels by ::PG:: Extreme Party Girl (on the marketplace)- as I said, they cost 99$L, but are more than worth that as they come as a fatpack and have a tint & texture HUD with chain scripts included! As for the hair and skin....I also got these on the marketplace. The hair is Bride of Frankenstein by Paper Heart - a steal at just 1$L!! 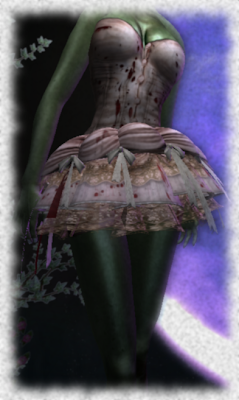 And the skin is Zombie Girl from the female skin collection by ::Miss.Murder:: - I LOVE this skin because I wanted something gory, but of course I wanted to be the prettiest zombie at the ball - and this ticked all the boxes....of course it's a bonus that it cost me just 10$L! 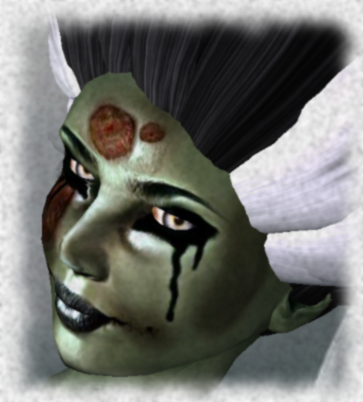 And later on today, I shall be updating with more spooktacular goodies that I've found on my travels around the metaverse - so please check back - I promise it will be something you won't want to miss!